In a most agreeable atmosphere, the Legault/Deslauriers met on October 19, 2002. 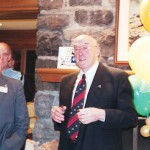 The Beaconsfield Golf Club, located in Pointe-Claire, added a special touch to this atmosphere that prevailed throughout the meeting in spite of gloomy weather. Welcoming the participants was conducted in a friendly manner and all were happy to greet one another or perhaps make contact with a cousin whom they might have lost touch with over the years. A very busy corner was that of genealogy manned by Luc (176), François (060) and Denise (282) who answered diverse questions all the while satisfying the curiosity of members attracted by the volumes of genealogy on display. More than 100 persons gathered in the hall to proceed with the meeting. A special meeting preceeded the annual meeting to deal with new modifications of the regulations governing ADNLD. The President’s report was presented, followed by the Financial Report and reports from various committees. Numerous questions were answered, an indication of a keen interest and always desirable for the survival of an association such as ours. 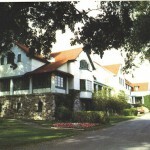 The group then proceeded to the convent where the historical old mill can be found. The history of it is recounted in a pamphlet which was distributed to those present and remains available to those who wish to obtain it. Mother Nature was on our side and the rain stopped and the beauty of the location delighted us. Under the direction of Mr. Claude Arsenault of the Genealogy Society of Ouest-de-l’Ïle, those present were able to benefit from a visit to the interior of the windmill and learn of its history. 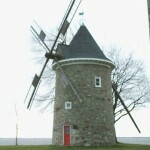 This windmill has become the emblem of Pointe-Claire, situated on the point of this peninsula where the sisters of the Congregation of Notre-Dame have their convent. We then proceeded to the Saint-Joachim Church for mass at 4:30 PM, celebrated by the Pastor of the parish, Jean Boyer, co-celebrated with one of ours, Father Michel Legault, m.s.a. of Cromwell, Connecticut. Hommage was paid to Monique Dubois Legault, founder of ADNLD and president for the past five years. 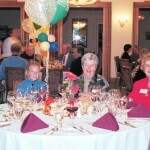 After mass we returned to the Beaconsfield Golf Club and socialized. Mr. Bill McMurchie, the president of the burough of Pointe-Claire, spoke a few words of welcome to all the Legault/Deslauriers present. He underlined the contribution of numerous Legaults on the Municipal Council of Pointe-Claire. 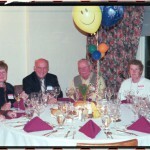 The Golf Club staff then served a delicious hot meal with wine. The Directors of the new administration council made a few draws for prizes and Mr. Claude Arsenault presented us with the history of Pointe-Claire with an emphasis on some of its ancient houses. The highlight of the evening was without a doubt the sorting of attendees according to their descent from Noël. Everyone moved to join the table of their ancestor. 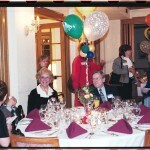 Many were surprised to note the close relationship between one or more persons assembled at the same table. Our genealogist, Luc Legault, took the opportunity to respond to various questions and give a presentation on genealogy as he conceives it, and what he sees can be done to further improve the database to provide more information to members. On that note, the wonderful day ended. The interest and appreciation shown ensures us that we can be proud of the work done by the Directors of ADNLD and it encourages us to continue in the same direction. I was pleasantly surprised at the historical and genealogical treasures that people had on our table at the meeting last October. I would have liked more space to spread out the documents and devoted more time to those seeking information. A big thank you to those who brought their personal documents. The participation was great! I soaked in the richness of their past and their enthusiasm. The interest shown by everyone in learning more about our roots and writing the history of our great family leads me to believe that we will surely meet again in the near future. We were disappointed by the absence of our venerable Mrs. Rose Legault who was unable to partake in our activities. We wish to offer Rose our best wishes. She celebrated her 102nd birthday on January 23, 2003! Bravo Rose! We admire you. In the exchange that followed our banquet, I must confess that my presentation had some shortcomings, but your participation quickly called everything to order! A point was raised about the fact that very little interest is shown by most genealogists when the ascendancy of females is produced on a family tree. Most often, the roots go back to the masculin side because this ensures the continuation of the family name. I would like to stress that our genealogy database includes spouses and their descendants. You will soon be able to produce your ancestry on demand. At the end of the evening, the new Administration Council should have applauded your presence and your participation. We were remiss in doing so.